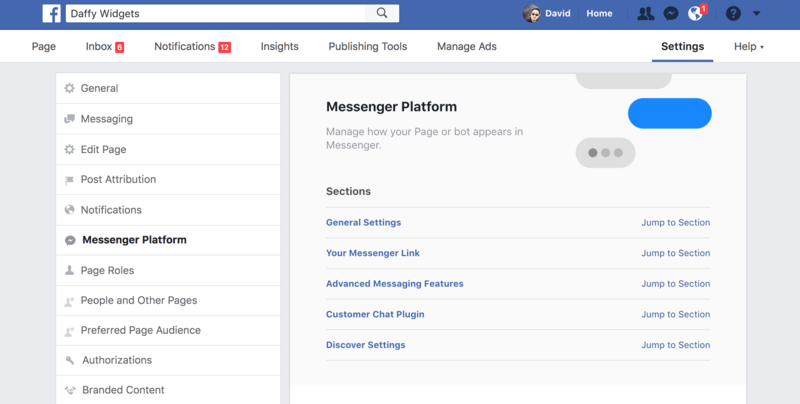 If you use Facebook Messenger bots to automatically greet customers and answer questions automatically, it's very likely you have many back and forths between the customer and the bot. But if you're also using Re:amaze and have your Facebook Messenger connected via social channels, the messages between a customer and a bot can inundate your Re:amaze Inbox. The Messenger Platform's handover protocol enables two or more Facebook apps to participate in a conversation by passing control of the conversation between them. This feature can be used in many ways to enrich your Messenger experience. For example, this protocol makes it possible for a Page to simultaneously use one Facebook app to build a bot for handling automated responses, and another Facebook app for customer service with live agents. To do this, start by going to your Facebook Page's settings page. 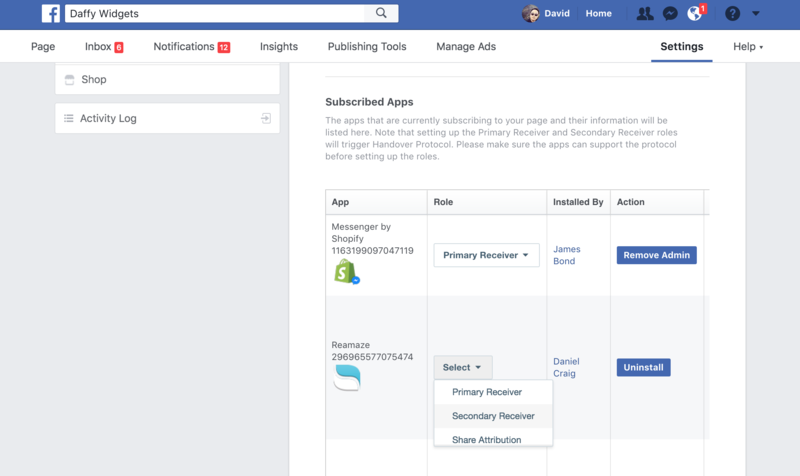 Click on "Messenger Platform" and then choose the secondary receiver option for your Re:amaze app. If you're already using Recart, all you need to do is connect your Facebook Messenger account to Re:amaze. Because Recart is already handling your bot-driven messages, it'll work with Re:amaze without further customization. When customers are interacting with the Recart chatbot via quick select buttons, these messages do not arrive in Re:amaze as they are bot-driven. As soon as the customer wishes to talk to a human agent and selects this option via a quick select button, the conversation will be escalated to your Re:amaze inbox. ShopMessage is a great chatbot platform for eCommerce. If you're already using ShopMessage it'll work with Re:amaze without any customization as long as your connect your Facebook Messenger account to Re:amaze. When customers are interacting with the ShopMessage chatbot via quick select buttons, these messages do not arrive in Re:amaze as they are bot-driven. As soon as the customer wishes to talk to a human agent and selects this option via a quick select button, the conversation will be escalated to your Re:amaze inbox. ManyChat is a popular chatbot platform for businesses that rely on Messenger. If you're already using ManyChat it'll work with Re:amaze without any customization as long as your connect your Facebook Messenger account to Re:amaze. When customers are interacting with the ManyChat chatbot via quick select buttons, these messages do not arrive in Re:amaze as they are bot-driven. As soon as the customer wishes to talk to a human agent and selects this option via a quick select button, the conversation will be escalated to your Re:amaze inbox. When you have a bot serving your Messenger channel, Re:amaze will automatically keep conversations resolved if the bot responds with any message. Conversely, Re:amaze will leave the conversation as unresolved if the bot does not respond. Make sure your bots do not send any autoresponder messages that don't drive the conversation to a resolution. This can leave conversations in a resolved state even though the customer is still awaiting a response from a human. This means you should avoid using a third-party bot as an autoresponder (e.g. "Thanks, we'll get back to you soon"). Instead, you should use Messenger's built-in autoresponder capability, which Re:amaze can detect and leave the conversation in the appropriate state. If the chatbot platform responds after a quick reply button, such as "Okay", Messenger will leave the conversation in a resolved state, preventing it from getting escalated to your Re:amaze support team inbox.